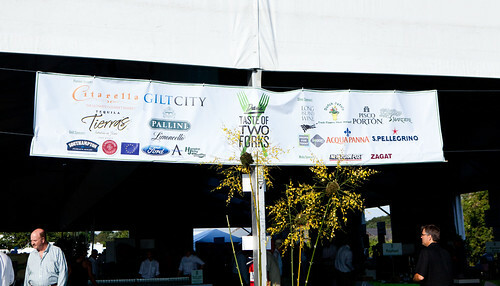 Last night was Dan’s Taste of Two Forks at Sayre Park in the Hamptons. 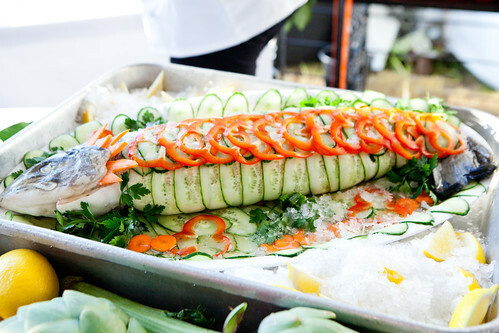 This food event celebrate the wineries and restaurants from both the North and South Forks of Long Island. 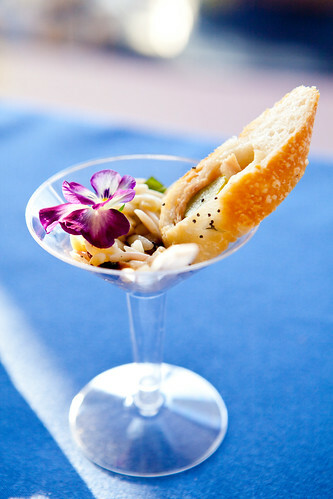 The event is also a benefit for East End food pantries through Have a Heart Community Trust. The set up was in a large white tent on the grass and dirt lands not too far from a few local vintners and gardening emporiums. As some of you might know, this is the understated town on the very east end of Long Island, New York where the wealthy and glamorous hang out in the summer. This event pretty much brought out some well-dressed, elite locals as well as young people like myself from Manhattan to this area to eat and mingle. 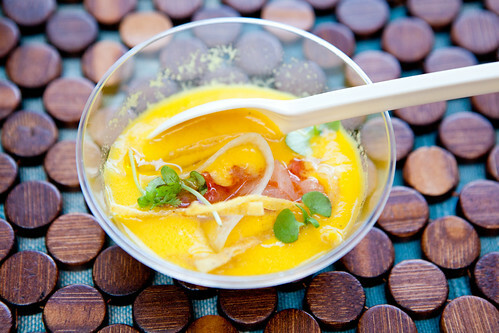 This inaugural, sold out event featured 45 restaurants, 24 Long Island wineries and 6 local purveyors of cheese (Lucy’s Whey), teas (Plain T and T Salon), and coffee (Hampton Coffee Company), with a live band during the VIP hour and a DJ afterwards to dance the night away. 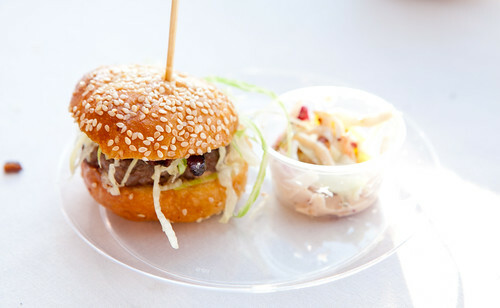 Majority of the food served that evening sways on the lighter, summery fare such as ceviches, a few types of sliders (one brisket and the other was a juicy burger topped with bacon, as seen above from LT Burger), and chilled soups. 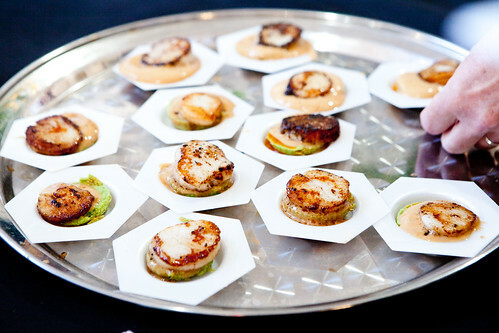 A few hot bites were out there that I found it a bit more interesting was Montauk Lake Club’s warm sweet scallop on top of a cool firm sweet pea flan, rather than the texture of cheesecake. 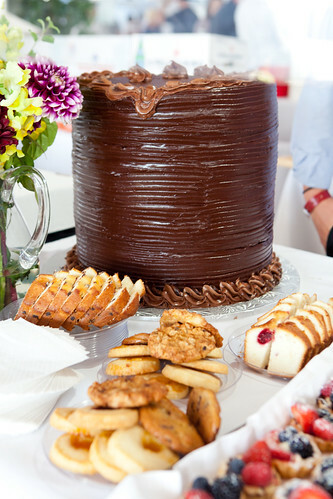 On the sweet side of the event, my two favorites were from the Blue Duck Bakery Cafe served an assortment of sweets like their delicious mini fruit tarts, freshly baked rolls, and what is seen above, a humongous chocolate layer cake. 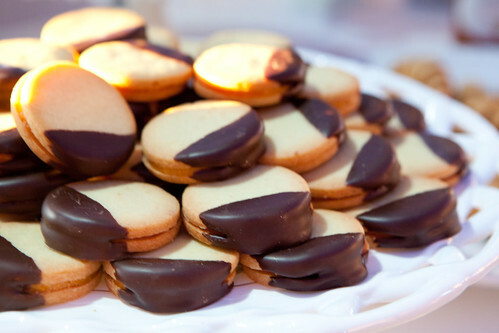 A New York City local, Sarabeth’s Kitchen graced the scene with their sublime cookies. My favorite of the five Sarabeth Levine served was the coconut-lime cookie sandwiches; others were great in their own way (decadent chocolate chubbies, rugelach, and linzer hearts) but the tropical flavors struck the summer chord that I craved that evening. The event was fun and the was good overall. The sold out event did make it crowded pretty fast when it got closer to 8 PM. While the tent set up was typical for events like this, I witnessed an unfortunate woman who worn stilettos and got her heel stuck in the ground and had her boyfriend assist her to get her shoe out, while walking on the grounds. Hopefully, next year the event organizers can find a place where a woman can wear her stilettos in a dressy event like this.